Splashing through mud, drenched by showers, accompanied by fish swimming in drains and millions of cane toadlets, the crew planted the very last tree into unplanted ground just before lunch. Richard Winter of Queensland Parks and Wildlife Service (QPWS) was there all day to help transport planters, plants, spades, raincoats and gear in a robust 4WD buggy. 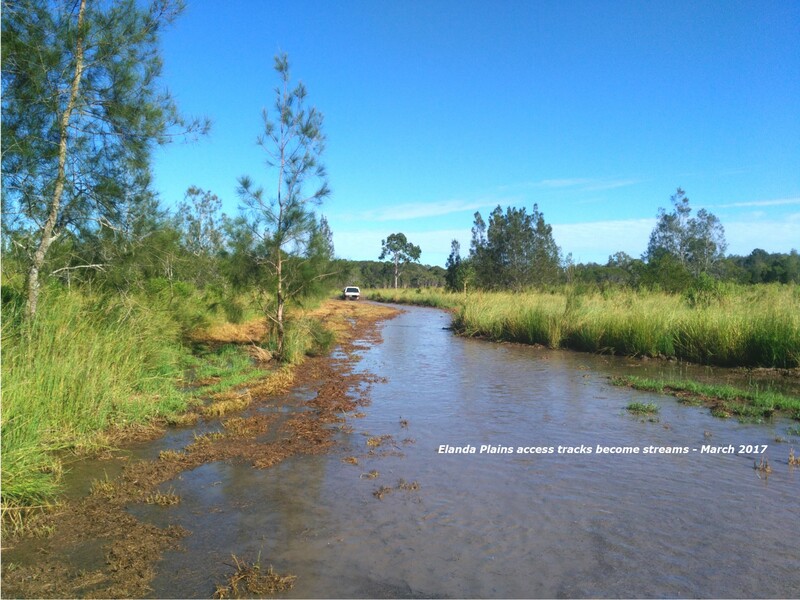 Project Manager CO2 Australia worked closely with Noosa and District Landcare Group and Queensland Parks and Wildlife Service to prepare and plant the project site at Elanda Plains near Lake Cootharaba. Funding for the project came from the Australian Government under the 20 Million Trees initiative of the National Landcare Programme. 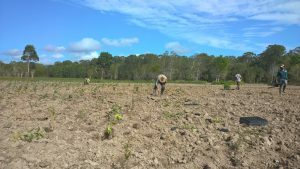 Noosa Landcare began planting on the site back in February 2017 in drought conditions. Along the way there came ex-Cyclone Debbie and other high rainfall events which made the site inaccessible for weeks at a time. Browsing damage from feral red deer and grey kangaroos saw the deployment of an 800 metre solar-powered electric fence to protect planted eucalypts in vulnerable parts of the site. The entire project site was prepared by QPWS in three phases – initial prescribed burning to remove the weed grass Setaria sphacelata, cultivation of the site using a disc cultivator, and finally rotary hoeing to break up clods and improve planting tilth. QPWS also made their Elanda Plains nursery available as a staging area for the tens of thousands of trees deployed into the field. Noosa Landcare Contract Crew supervisors and casual staff worked very hard over many days to get trees into the ground – deep, straight and sound. Supervisors applied strict daily quality control assessments to monitor and assure planting quality. Noosa Landcare Nursery propagated the majority of the planting stock, often with seed collected by permission on or near the project site itself. Nursery planning, propagation and logistical systems were tested along the way. Several improvements were introduced to cope with the enormous turnover of plants required for Elanda Plains. The next three months will see intensive targeted replacement planting across the site as weak spots are filled.